DeHaan Construction was founded February of 1985 and incorporated in 1998. Prior to this Darrel DeHaan, founder and owner, worked for Molendyk Construction, which was operated by his father-in-law. He worked for his father-in-law for approximately eight years before starting his own construction company. Throughout the years DeHaan Construction has grown in its ability to do larger projects and more difficult construction. DeHaan Construction is not limited to a project type, but has a wide range of capabilities including: build-to-suit with lease option, commercial projects, industrial projects, residential projects, retail projects, and agricultural projects. DeHaan Construction Inc. is located in southwest Montana and offers service throughout all of Montana. It is a family owned and operated by five brothers and their dad at its core. Each individual has a unique set of abilities obtained through schooling and life experience. By keeping the company financials, design process, and mechanical work internal, the company is able to keep overhead costs to a minimum through this unique structure. Also, DeHaan Construction is proud to offer a unique project experience by often doing all phases of a project from start to finish, again lowering expense. 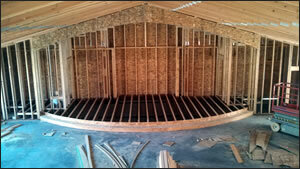 DeHaan Construction Inc. offers big company ability with small company service.